Seismic loading rates can significantly affect the behavior of reinforced concrete (RC) elements, yet little data are available to quantify these effects. Shaking table tests allow the study of loading rate phenomenon, however they suffer from difficulties in assessing causality (direct assessment of causes on effects) and are expensive to conduct. An alternative is to test individual RC elements by directly imparting high-velocity loading protocols. However, multi-actuator setups are necessary to achieve seismically representative loading and boundary conditions, which entails particularly challenging control requirements. This investigation used recent advances in real-time testing hardware to study effects of loading rates on the structural response of lightly confined reinforced concrete columns. A pioneering test setup, in which three actuators are controlled independently at high velocities was used to test a series of columns until axial collapse. Of particular interest is the response of non-ductile reinforced concrete columns subjected to earthquake excitation. To the best of our knowledge, there has not been any three degrees of freedom tests on reinforced concrete components reported in the literaute. 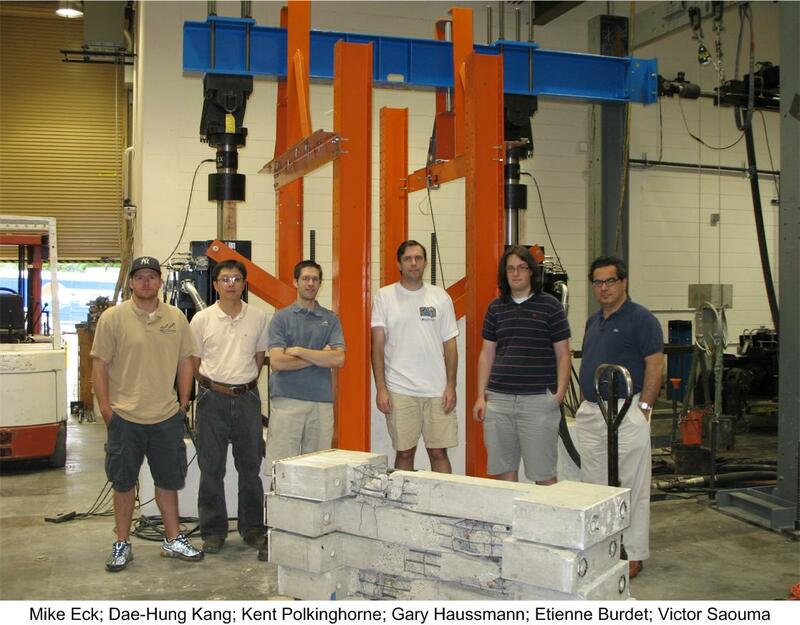 Columns tested are identical to the non-ductile ones in the shake table tests of Ghannoum (2007) at Berkeley. Ghannoum, W., Saouma, V., Haussmann, G., Polkinghorne, K. and Eck, M.: 2010, Rate effects in reinforced concrete columns Submitted for publication.